Rahn Industries is a HVAC/R coil engineering and manufacturing company. We are recognized as a world class quality leader that has been engineering and manufacturing cost effective OE and custom HVAC/R coils for heating and cooling applications. We have over 30 years of product design, engineering and manufacturing excellence with a commitment to fast turn around and superior customer service to meet your precision coil manufacturing requirements. Rahn Industries has developed and implemented a thorough Quality Management System. Rahn Industries is ISO 9001:2015 certified. Rahn Industries is committed to understanding the needs and expectations of our customers and providing them with coils and protective coatings that meet or exceed all specifications and are based on the pursuit of our quality objectives and continuous improvement. 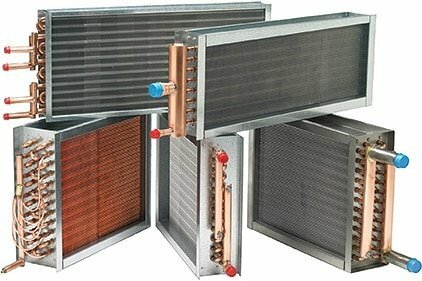 Rahn Industries manufactures a full range of fin and tube heat exchangers including chilled and hot water coils, glycol coils, booster / reheat coils, evaporator coils, condenser, steam and other exact fit OE, custom and severe duty coils that are guaranteed to fit and perform. We are AHRI certified; UL listed and have ETL certification for fan coils. Rahn Industries also is a protective coating certified applicator for HVAC/R coils and equipment. We have a dedicated plant that offers coating services and products for Severe Duty, IAQ, Medical, Coastal, Marine and Industrial applications. Rahn Industries has a full line of spray and immersion dip / bake protective coatings including BlyGold™ , Heresite™ , PPG™ and we also feature our Rahn Kote™ enhanced protective coatings.